Happy Tuesday everyone and Happy 4th Birthday to Lily Bee Design! I am soo excited to be celebrating this great accomplishment with Kristen and team. We'll be celebrating all week long with a new hop each day this week through Thursday and lots chances to win new Lily Bee Design prizes! For today's hop, we tasked with creating a "celebration" layout, drawing inspiration Nicole's sketch posted to the Lily Bee blog. I chose to scrap this Instagram photo of my daughter at her most recent birthday party! I layered lots of distressed papers, vellum, stitching and label tags over each other to create the mat for the frame as well as the paper strips at the bottom. The Chit Chat stickers were the perfect embellishment accents and tied the page together. I included a journaling tag that says "memories" from a previous Lily Bee collection, behind the photo for my journaling. 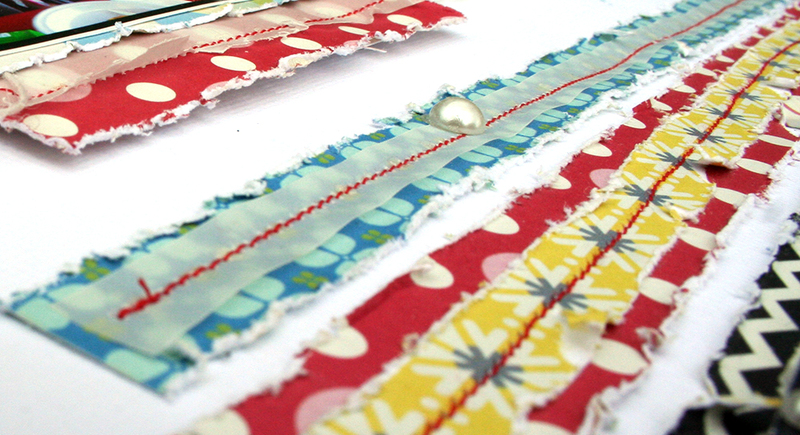 Today I'm giving away some of this & that from my Lily Bee Design stash. All I ask is that you follow my blog (but only if you like what you see here) and leave me a comment telling me what you've recently celebrated or are about to celebrate! Make sure to visit the Lily Bee blog again tomorrow and Thursday for new hops with the rest of the design team and more chances to win! Your layout is incredible! Loving the layering!! Gorgeous layout...the layering and dimension is fabulous! We have had a lot of celebrations in the past few months, welcoming a new baby boy, celebrating both of our daughters' birthdays, baptism of our son, and now we are looking to celebrate the end of an extremely long renovation of our home! Ready to relax from that will be a fabulous celebration! lol. Thanks for the chance! This is gorgeous! I loveeeeeeeee the colors, the distressing and the stitching!!! LOVE the layering and stitching! I love the layering and distressed edges! I am already a follower, and the next celebration in my family will be my Birthday! 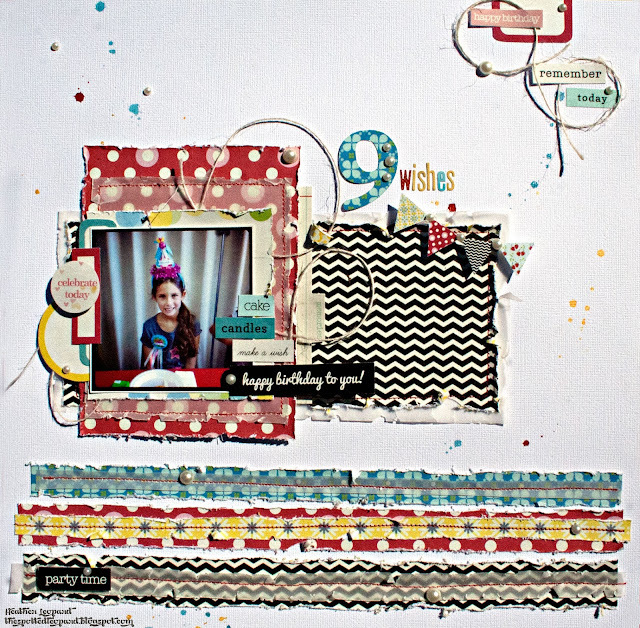 Adorable layout, I love the texture the strips across the bottom create! Or next celebration will be our son's baptism in April. Lovely layout Heather. Love the torn fabric effect. Love the layout and all of the layers! Thanks for the chance to win! I love it! I love the colors, the layering, the stitching, the use of twine, the distressing...this is my style of scrapbooking! I've been a follower for a few years now. Love the way the layers all look like fabric! And in June we have a big one to celebrate: my son's 18th birthday!!!!! What a great layout - love the layers and vellum. Love the sabby chic-ness of this LO. WOW! Simply gorgeous, I love the details! Wow - love all of the stitching and the twine loops. Fantastic layering and distressing! Great layout! So cool, love all the texture, layering and details on this layout! I love the stitched distressed paper strips at the bottom of your layout! We recently celebrated my daughter winning a city wide essay contest! Great layout! I love the colors & stitching! The loops of twine add just that perfect touch to all those fabulous distressed layers. Wow, what a layout! Your distressing is awesome. I love the paper strips. Incredible job on this layout. 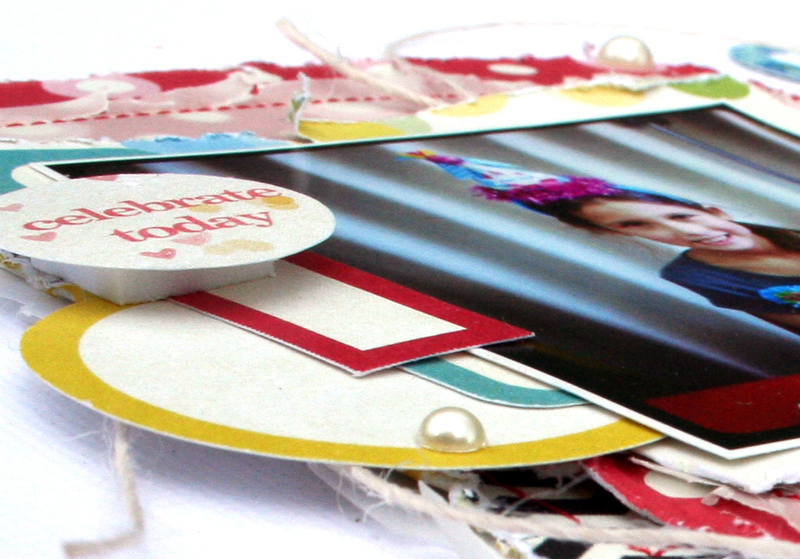 Love the paper strips and confetti paint dots. We are about to celebrate our 9 year olds bday and our baby's first birthday on Sunday! WOW-another great layout! My daughter's 14th birthday will be the next celebration at our house. love all the distressing! beautiful! We are gearing up to celebrate my mother-in-law finishing her last chemo session, and to see how her numbers are now! Praying for great results! Awesome layout! I love the layers and distressing...beautiful! Love the distressing and stitching on your page! I'm now a follower. Our next celebration will be the first week of March, when we celebrate my niece's 11th birthday and my son-in-law's 32nd birthday. What a fantastic variety of colors and patterns and you did a great job providing the unifying elements of vellum and stitching to tie them all together. My family will be getting together to celebrate my nephew's birthday but sadly I won't be able to attend :( So the next celebration for us will be Saint Patrick's Day. Love all the layers and distressing! wow this layout is amazing!!! The beautiful stitching and the paper strips... wow!!! Loving this page Heather! The addition of the twine really makes the page have a nice feel to it! Our latest celebration was a month ago for my husband's birthday- great cake and fun! Awesome page! Love the splatters and the distressed, layered strips at the bottom! TFS! Very nice! I love all the texture and color on your LO! Fun page! Your use of mists, layered and distressed elements, and the way you curled that string/twine as accents on your page - SO COOL! love, love, love this page. Consider yourself pinned. Following the blog. Just celebrated my 41st bday - quiet with family. Last year was a big blow out year. Seriously gorgeous. Love the layering and the stitching, so much dimension. Oh heather, I already follow your blog... I love your projects and keep adding to my to do list. that Valentine mail box is at the top of my list:-) I will soon celebrate my tenth wedding anniversary!! Such an incredible layout, the distressing is gorgeous! Love the dsitressing of the papers and your colors are fantastic. gorgeous layering! love the inspiration along the blog hop! wonderful page - love all the distressing. Love to subtle touches with pearls. Father's birthday is coming up next. 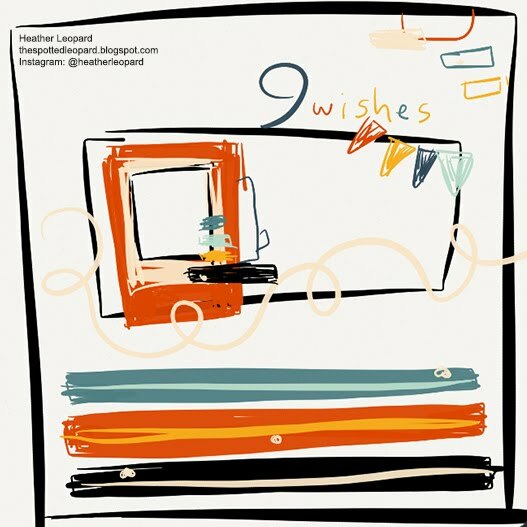 Love your 9 wishes page! Lots of great colors and textures! Great layout! Love all of the layers! I think I am already a follower but I DO love your work and this is fantastic!!!! What a great layout! I love the string! This layout is GORGEOUS!!! LOVE all the distressed edges!!! Love your layering! Stunning layout! I love your layers on this layout! Gorgeous. And again, I love the different take on the sketch. Sweet page - love all the layers. this is GREAT! I love it all! great layout-love all the layers and twine! we just celebrated my dad's 60th birthday and my son's 3rd birthday last week! I love all the strips of paper and I'm a follower! Love all of the distressing! Beautiful layout! Is it pathetic to say I wouldn't have thought of distressing using LilyBee? Love your layout!